It’s been such a long winter around here…I am so glad it is officially over. Now that it’s spring, I’ve got cleaning and organization on the brain. In my book One Simple Change , I wrote quite a bit about clearing out the clutter from your life. In this post, I’m going to excerpt some relevant content from the book; I also have a great giveaway to help you out with your pantry organization and storage needs! I feel anxious and unhappy when my mental and physical spaces are cluttered; the existence of clutter makes it hard for me to get things done. Is the same true for you? It can feel so amazing to let go of the baggage that may be bogging down your mind (and I give some suggestions for how to do that in my book); focusing on ways you can clear the clutter from your home can do wonders for your well-being, too. Take a look around you: Open your closets and your drawers. Are you holding onto things you don’t need? Now is a great time to let them go. You will likely feel so much better when you do. One of the places in just about everyone’s home that can typically benefit from some clutter control is the pantry. If yours is a mess, it may be hard to know where to begin, but I suggest you get started simply by taking stock of what you’ve got. Clear a surface so you can empty out your shelves and see what you have. Next, toss everything that’s past its prime. Most packaged and processed foods should probably go. (Though if these don’t make up much of your diet, I don’t think you should worry too much about them…I believe there is room for all types of food in a healthy diet.). I hate telling you to throw things away, so if something is compostable (or suitable for donation), please go that route. A lot of people don’t cook much because they don’t keep many staples in their pantry. If this is going on for you, now’s the time to make a change! I want you to restock your kitchen with everything you need to create wholesome, nourishing meals for you and those you love. My goal when I stock my pantry is to know that I can throw together a tasty meal with what I have on hand pretty much anytime. I want to be able to make any dish that pops into my head, or that I see online or in a cookbook or magazine, with a very minimal amount of shopping for additional ingredients (like fresh fruit or vegetables, dairy, or meat). The more items I have on hand, the better off I am. So I keep a lot of staples in my pantry. I’ve got many different oils and vinegars; dried legumes, like black beans and chickpeas; different types of lentils; grains and pastas; various nuts, seeds, and dried fruits; a variety of unrefined sweeteners and sea salts; and a giant collection of herbs and spices. I’ve also got a pretty big collection of regular and gluten-free flours for baking. 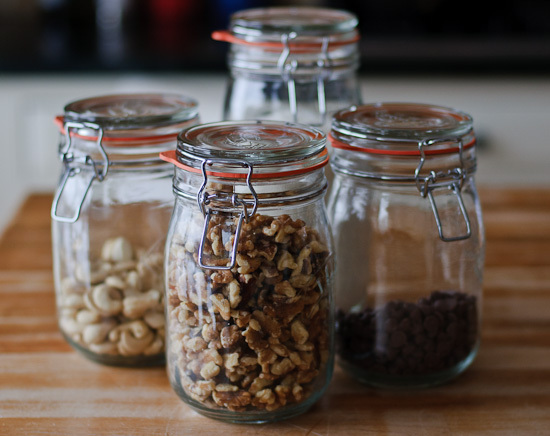 I buy as many of my pantry items as possible in bulk (to save money and avoid packaging), and I store everything that is suitable in glass jars with tight-fitting lids. This works very well for keeping my ingredients organized and away from pests; it also means I can keep as much of my food away from plastic (and its potentially unsafe chemicals) as possible. I also have a lot of home-canned fruits and vegetables, which I preserve each summer. I make many jars of sauce with tomatoes from my garden, for example. Though homemade jams can end up being pretty high in sugar, I make them with local fruit and derive great pleasure from having them around. I use them in small amounts throughout the winter, and I also give them as holiday gifts. Do you have a lot of spring cleaning and pantry re-stocking up to do? To help you tackle the organization of your pantry, my friends at MightyNest will give one of you a set of 12 glass clip-top Kilner Jars. These are free of worrisome chemicals including BPA and phthalates. 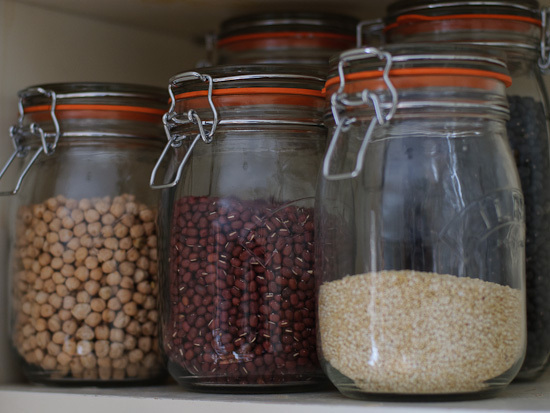 They are perfect for storing all the dry goods in your pantry, such as beans, grains, nuts, and seeds. You can also use them to store things like flours, coffee, shredded coconut, and chocolate chips. Kilner jars are dishwasher safe. The retail value of this giveaway is approximately $100 and it is open to readers in the USA only. To enter the giveaway, please leave a comment on this post (telling me what you plan to let go of) AND follow the directions found in the widget below. Please know that when you use the widget to pledge to get real about real food storage, you’ll automatically be entered to win the giveaway and you’ll be signing up for the MightyNest for Schools Program. When you sign up for this program, 15% of any purchase you make from MightyNest in the future goes back to the school of your choice (it can be your child’s school or simply a school that is in your local area). Our family loves to play board games but there are some that we’ve received over the years that no one has shown interest in playing. It’s time to clean out the shelves and donate the ones that have collected too much dust. I pledge to let go of the clutter that collects on the end of my kitchen counter. Mail, empty egg cartons, etc seem to pile up in this one spot until it gets out of control. I’m planning on donating the contents of boxes I have stored and not opened in over six years since moving that just take up space in my attic. I have been purging my garage pantry and getting rid of all the boxed things there. I don’t use many pre-prepared meals but I’m trying to use even less (except for the last minute mac & cheese for the those nights I just can’t get kids fed fast enough). I joined a CSA so I’m also letting go of non-organic grocery veggies for organic farm-raised veggies and fruit. I have holding on to oatmeal (old fashioned and quick varieties) thinking that I’d make oatmeal cookies for the kids. But we no longer eat wheat/grains so they’re only taking up space. They will be the first to go and then we’ll see what else follows. Lots of clothes and general junk! I have pantry reorganization on my to-do list. Right now, I have all the essentials I use for cooking but stored in a haphazard and somewhat inaccessible manner. These jars would be very helpful to store my beans, flour, lentils, etc. I would like to get rid of the plastic bags that currently hold my dry goods, thanks so much! We seriously need to have a good declutter, in every room, the shed and garden. Everything takes so long to do because you can’t find anything and it is definitely not good for my mental health. BUT I am so bad at getting rid of things – hey ho! Due to some water damage, my pantry will get a spring cleaning next weekend. Luckily we didn’t lose any food, but a few paperboard storage boxes were lost. I’ve been holding on to cake decorations that need to move on. im moving soon, finishing law school and starting a career, so im trying to let go of all the clutter i have accumulated. i collect too many things! clothing is definitely on the declutter list! The whole household is on the declutter list, donate, donate, donate! I have begun, but will do more to get rid of clothing that I like, but that no longer fits. The more difficult task is to convince my husband to do the same! I will let go of (donate) old clothes and shoes that I do not wear on a regular basis. I plan to change all my plastic storage containers to glass! I wish I could figure out why I have soooooo much trouble parting with “things”. My house is full of these”things!” And I keep buying more :/. My pantry is just another example of a closet full of foodie “things!” HELP!???? Are there Any guidelines for getting rid of jellies, jams, and things without expirations? I promise to throw away all old items and re-organize my pantry! At least it will be a start! :)) and the jars are a brilliant idea! Our pantry needs an overhaul too. Hubby has pulled out some expired things and that is a little scary. I’ve been purging out processed foods. Would love the jars to have the healthy stuff out in front. I will be letting go of some dried herbs from the garden. I just have too much. Will probably give it to the neighbors. I plan to get rid of old spices. I plan to let go of over frozen food items! No more grocery shopping until I finish the older items I’ve frozen! Oh how I need these jars! I never know what I have in my pantry, it is a jumble! These would help so much. I must keep cereal and granolas too long! I have a sea of opened boxes and packages. These jars are so pretty and I could tell what I have without them going bad so fast! You have inspired me – my pantry is in OK shape except the “nuts and baking department” – I am going to tackle those this week!! My husband and I are retiring this year and we are starting to downsize big time. I’ve been getting rid of work clothes slow but sure. I’m getting rid of all plastics in my kitchen. I’ve been meaning to buy glass jars for many uses. Kitchen and Cleaning. Plastic storage containers are first to go, then paper clutter – magazines & recipes I can store on the computer. Lol I need to declutter my.entire house. This will get done this spring. I am finishing up some schooling that has taken alot of time for the last 3 years. When I finish I am going out to eat, having a couple drinks them come home and write a schedule for cleaning and de-cluttering and organizing my house!! I love glass jars. Thanks for giveaway. I am going to clean out my fridge and cabinets. Then I will move on to old clothes and shoes. I just retired and am getting rid of anything I haven’t used in the last few years. Books and I mean piles and piles of books. I don’t read them anymore plus some of my husbands shools books that can go to some one who can get good use of them for school. Project in progress hopefully will be done befor mid April. We’ve started spring cleaning everything! So far my son’s room and the office. Can’t wait to do the rest of the house! I am constantly de-cluttering, taking things to donation place, and then bringing more stuff back in. So it is a continual process and that is OKAY. What I really need now is the home to look “lighter”. I say this as I am going to go under the counter and take out all of my pots and pans and clean there. Wish me luck. P.S. Love all glass bottles in every shape and size. Thanks. I definitely feel more relaxed when there is less clutter around- but I agree, it is a continual process. I often feel like I remove some clutter, only to feel justified in then adding more in. I would like to be better about keeping my things/possessions to a minimum- only having what is necessary or what I use regularly. My downfall is books- I love keeping books around that I have read and enjoyed. Perhaps if it adds to happiness, it is okay? I’ve lived in my new house for more than a year and still have boxes I haven’t unpacked. My spring uncluttering begins with them -I imagine if I haven’t needed what’s in them for this long, the contents can go to a thrift store. Would love those jars in my pantry! Have to say that my pantry organization is in a pretty good state: but that is mostly because a couple of years ago, I moved the bulk (ha!) of my grains, nuts, spices and dry storage into Ball jars and stored them on open shelves in my kitchen. Since I see them all the time, I’m much better about using them in my cooking, keeping the supply consistent and rotating stock. While the one food cabinet is still jam-packed, it is full of lesser-used items, so while cluttered, it doesn’t bother me. The closets on the other hand…. It is time to let go of all the excess clothes and toys in our home. I am often asked if I own a resale shop or have a home day care – neither of which do I own. We have said we are going to get rid of it all for two years now but have never followed through for various reasons. I am taking the entire off from school and I will accomplish these tasks by the end of summer. It is shameful the amount of things we have accumulated and it is now time for someone else to use it. Kids puzzles and my old magazines. Such a huge amount of space dedicated to things no one will ever use! Can’t wait. It’s time to finally get rid of the clothes that my kids have outgrown. I just went to the doctor. I know I have gained weight, but now I have a glucose (pre diabetic) issue. So, I have been going through my cupboards to get rid of the foods that are not good for me. I have joined the Y and am trying to better myself that way. I am in the process of organizing my pantry and buying foods that will keep my glucose level down and hope the weight will come off soon. My next things to go will be plastic storage and non-ceramic/iron cooking pots and pans. I just went through my “beauty products” and I’m fairly pleased with all of that. There’s a couple of not-so-good-for-me things, but the rest of it is good clean stuff. My food is always a work in progress. Ha! I’m going to let go of the crafty items that I thought I would use one day. I plan to clear out some of my office clutter. Did the pantry recently! Would love more jars! I need to let go of the irrationally high expectations i have for myslef and say n to things that I can not realistically accomplish. that should free me up to go through a few boxes and empty the dishwasher…. Plastic containers. Not just ones I purchased, but all those that have multiplied in my pantry. We plan on getting rid of lots of basement clutter…donations galore! :::sigh::: I guess it is time to donate the baby clothes in the garage…. Getting rid of ALL plastic storage this week (on spring break, thankfully) and repackaging in glass and/or aluminum. I am getting rid of excess/unused kitchen gadgets and plastic containers. Old paperwork, and computer parts that my husband stashes everywhere. Some old jeans that are so dead. My pantry is in pretty good shape, but a little re-organizing is in order. I have two major sources of clutter…clothes that our family either doesn’t wear anymore or those my girls have outgrown. The other is magazines! They are filling every void in my house it seems. I’ve cut way back on my subscriptions, but have a hard time letting go of the good ones…which, by the way, I never look at! I just reorganized my pantry yesterday and tossed old nuts that I hadn’t finished, I cleaned out the freezer and used the last of my tomatoes and pepper to make a wonderful sauce, which gave me room for all my specialty flours in a single drawer so I can find everything easily when I’m baking. I make everything from scratch, so organization for me is just making sure that I rotate and keep track of the age of items so that I use them before they expire. I also need to make space for new summer produce storage – since I don’t have a basement, everything needs to fit in my one little closet that I’ve converted into a pantry. Now we just need sunshine so our garden will grow! I’m working on gradually changing cooking utensils, storage containers, etc. in the kitchen and then moving on to the rest of the house. We’ve been cleaning and purging a lot lately and I love how open and clean it makes the house feel. While we still have a few spots left to tackle, the amount of stuff we’ve removed already is quite significant. I love using storage options like these jars in my pantry, as I am so visual that it really helps me to be able to actually see the contents of what is in there. I plan to rid my pantry of any and all processed food. I have improved in this area over time; however, I now need to completely eliminate it for the health of our family. I have enjoyed reading the your posts and stories on your website. I’m so glad I came upon it today.